quick-die-change system. 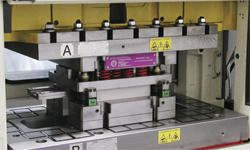 Use M-Tecs apparatus to clamp existing dies without retooling. Since magnetic clamping force is evenly distributed throughout the base of the die, die movement is minimized and tool wear reduced, minimizing die-maintenance costs. Permanent double magnet technology allows clamp forces to be maintained without the need for power—power is only needed to clamp and unclamp. Safe clamping is ensured thanks to a multi-level safety system, including a double current sensor, LED diagnostic panel, multi-step clamp/unclamp process, detaching sensor, and die-position limit switches. The magnetic platens are custom designed to suit the application, and the magnetic press bolster can be designed to incorporate Hilma die lifters and bolster extensions.